CLARITY: Awaken your life's purpose and passionately express it in your career. POWER: Tools to overcome resistance to unleashing your purpose in your life and career. CONFIDENCE: Take bold, courageous purpose-aligned action. COMMUNITY: Join a global community of others all saying yes unleashing their purpose. You want to be passionately, creatively unleashed in your career. Your heart aches to serve others and make a BIG impact, but something is holding you back. You crave a life and career of growth, connection, creativity, service and achievement. Are not able to commit to do this program in community. (Without sharing your experience with others on the journey, your resistance will make you stop doing the program and go back to the old ways - GUARANTEED). The Global Purpose Expedition is a 6-month, 10-lesson, self-paced, group purpose discovery program that will empower you to discover your higher purpose and bring it alive so as to be able to live it creatively and passionately in your relationships and work. RECOMMENDED AND OPTIONAL: If you complete the GPE in 3 months or less, you will receive another powerful course, the 90-day Purpose Embodiment Program. SUCCESS: Purpose is correlated with higher levels of income and wealth, making you 5 times more productive, 4 times more likely to be engaged at work and 50% more likely to be a leader. LOVE: People who know their purpose are regarded as more attractive and are 31% more likely to be in love. HAPPINESS: People who know their purpose are 64% more likely to be fulfilled at work. VITALITY: People who know their purpose live up to 7 years longer. Explore this research and much more! During this phase, you’ll get connected to what is pulling you into a big life of purpose and how humanity stands to benefit from you coming fully online with your purpose. During this phase, you are leaving home and exploring the beyond. You are searching for further clarity, looking more deeply at what breaks your heart. 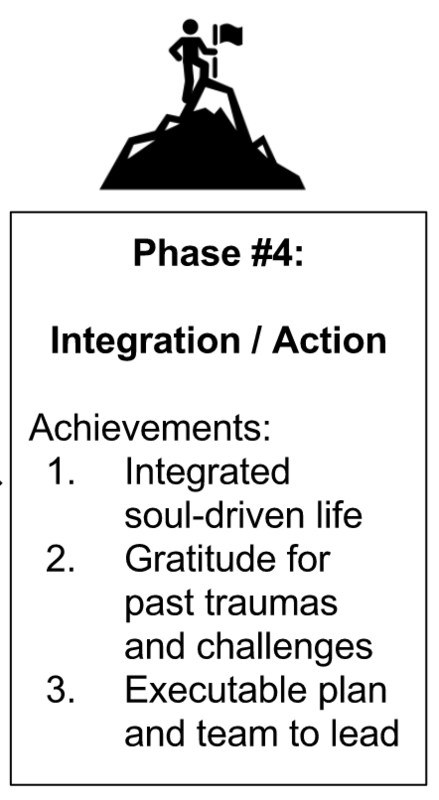 Also during this phase, if it hasn’t happened already, the new possibilities for a more purposeful life will arise. Week 4: Purposeful Titans - you’ll gain the wisdom of three purposeful titans, by interviewing three people who are living lives on purpose or have achieved mastery in a field you are passionate about. This phase is the most intense and rewarding part of the GPE. Your pre-purpose life is protected by a formidable web of resistance, and you WILL encounter resistance to your purpose, to completing the GPE, to the perceived implications, considerations and constraints this new information reveals. You will begin to confront your purpose and get hooked by reasons why you cannot do this, or why now is not the right time. This is collectively referred to as “The Trials” - your resistance to change, your fear of leaving home. To actually find and embody your purpose, you’ll need to be tested, to endure and navigate The Trials of your resistance. In this phase, we’ll look at all the ways you have historically been stuck or blocked from finding your purpose and taking purposeful action. 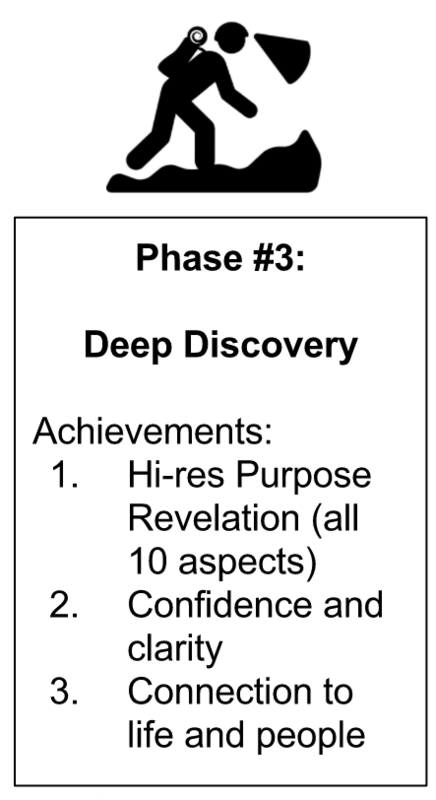 Week 5: Default Purpose - you’ll discover the core types/themes of resistance and how they show up in your life. 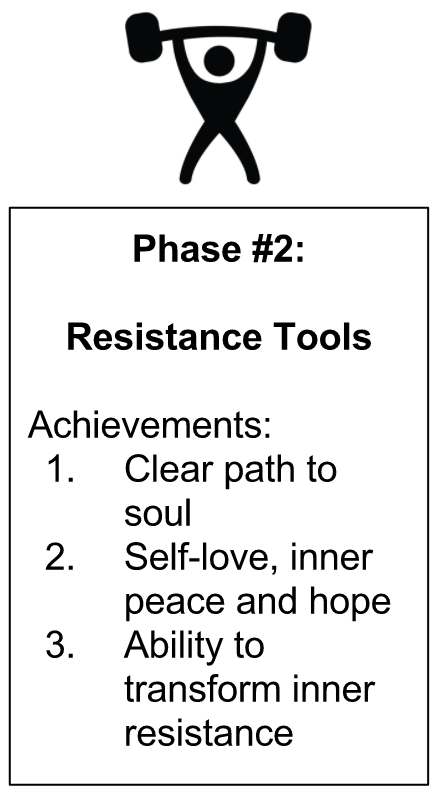 Week 6: Transforming Resistance - you’ll get the tools to uncover, transform and overcome future forms of internal resistance, and be empower to take purpose-aligned action in every area of your life. 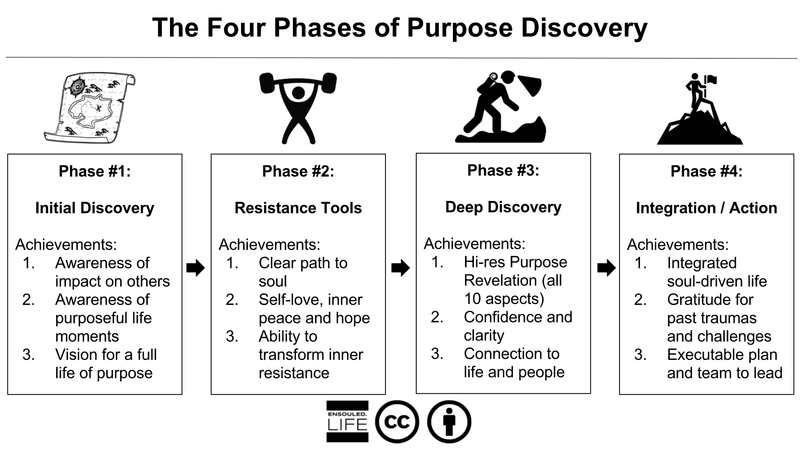 Now that you have passed The Trials, and your resistance is cataloged, you have two new powers: 1. you have the power to overcome your resistance to living your purpose and 2. you have a more open channel to uncover more purpose information. In this phase, you’ll be guided through two powerful methods to reveal hidden aspects of your life’s purpose. Week 7: Soul House - you’ll deepen your connection to your soul and learn the wisdom of various incarnations of your soul - young, healed, activated, ancestral and universal. Week 8: Jungian Journaling - you’ll gain greater clarity on your craft, who you are meant to serve, how you contribute to them and the next step on your journey, your mission. Week 9: Future Walk - you’ll get clarity on the next step on your path, as you will visually move into your future and reflect back to the present moment on what you need to do next. Week 10: The Purpose Project - You’ll get connected to the people you are meant to serve in the world, and craft a project to start living your purpose in the world. You’ll also redo the Purpose Assessment Tool to see how far you have come the beginning of the course and receive your certificate of completion. BONUS #3: Planet on Purpose Audio Book. Read by the Author, Brandon Peele. Discover your path to purpose, the science of purpose and what it feels like to join a global movement. Thousands of people from over 50 countries have taken this course (and it’s predecessor, the Purpose Challenge). 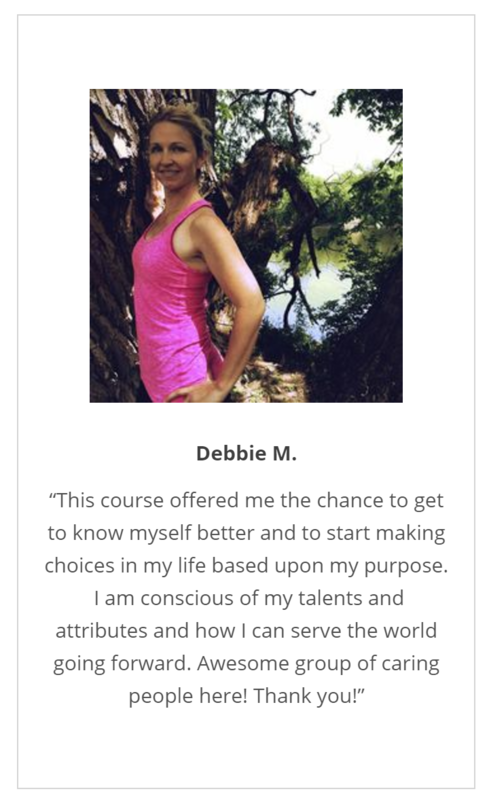 95% of those who have completed the course reported a deeper connection to their life’s purpose, and said they would recommend this program to friends and family. I invite you to learn about the experiences of the actual participants in their own words. “I have spent 64 years trying to ‘figure it out’ and Brandon helped me cut to the chase!” Cheri A. “I recommend this program to any person who wants to find their purpose in life. This is the best thing that has ever happened to me. Until today I was not really sure of what I wanted, but now I know so much about myself I can't ever get lost again. The support I got from the group was very useful, it made me feel comfortable and that I was not alone in this journey. I thank Brandon and the team for everything they did!” Izabella S.
“I would recommend doing this program to anyone. It is the most important course I have ever done. Not only have I found a new lust for life, I also learned some basic truths about myself. I now know that, if in doubt, I have to consult my various personas to remove any hesitancy. This course taught me newfound respect for myself and also the people that I encounter, and will meet in the future.” Paul Z. “This is a wonderful and powerful opportunity to give to yourself. It's a gift, not an assignment, and the heart and sincerity you put into it will spread like the rings from a drop of water in a clear lake.” June H.
“I absolutely enjoyed this course. The course is very well articulated, and provides greats insights and tools to move forward towards a purposeful life. Brandon Peele clearly knows what he is talking about, and in this program, he nicely brought together some key learning materials for anyone who wants to get closer to the full expression of their being and live purposefully. 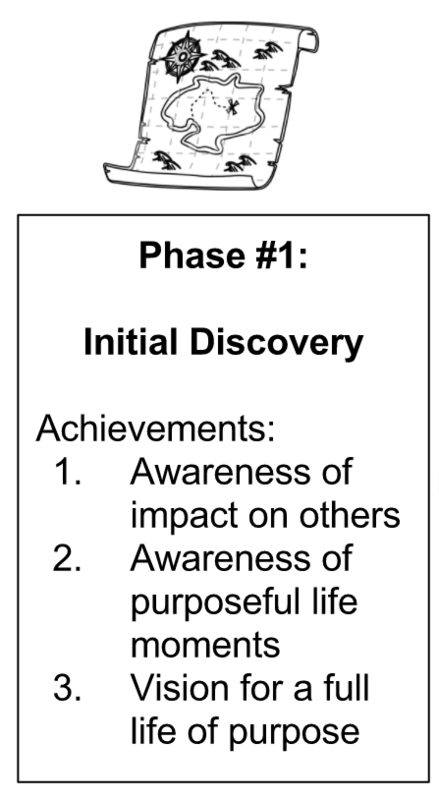 Personal insights, self introspection, working on resistance, communication, initiating a purpose project, connecting and reaching out for support, taking action - all the important elements of a purposeful journey are in there. I'd recommend the course to anyone.” Jerome M.
“This program turned out to be such a revelation, in many useful ways - say, in how I view myself, realities of this world, and what I can do about it... then, no, of course it's not about ‘it’ - rather, it's about myself, my ability to define my world, and make it work. I can't comment enough on Brandon's daily words of wisdom - almost every time, he would touch some parts of my consciousness, its nerve - seamlessly guessing, correctly, the very things that are bearing on my mind. Felt like Deja vu sometimes… what this world is really missing is its purpose, being declared loudly, followed relentlessly, and judged by no one but god's will... before it's too late.” Vladimir V.
“If you've been struggling with knowing why you are here on the planet, or maybe you know but can't quite bring it out, this is the course for you! Learning from a relatable, honest and open-hearted visionary is an opportunity not to be missed. On a personal note, I learned that I can turn my wounds into medicine. I can see the ways in which I felt unsafe and unheard to give that safety, connection and support to others. The container of the group was so supportive and it took the work to a deeper level by being able to share in the safety of the group and have feedback on my progress and then also give support to others.” Julia C.
“This course is a powerful masterpiece. It moves one from questioning what that thing is that makes your heart sing, to creating an actionable, exciting project that will bring more clarity, joy and vitality into your life.” Myrna B. “I'm a self-help junkie and have done so many different programs, most of which I haven't completed. This time I convinced my mom to do it with me, and although she was hesitant, she agreed. We both gained interesting insights and really enjoyed talking about each of the exercises. I really felt like this program actually lead to tangible results! Truly an awesome experience! Especially when shared!” Tiffany A. “Having spent a few years working on self improvement, transformation and finding a path in life. I have always struggled to feel connected to my version of my purpose. This course gave me practical steps and actions to take to deliver on this. It was an In-Action course which was fantastic and engaged me constantly.” Katherine O. “This program is very thorough, with many explanations, tools and presentations and is the best way to achieve a specific life purpose for the individual that I have come across in my 92 years of life. I had participated previously with two teachers on the subject of life purpose and so I can evaluate what a wonderful instructive program is presented here.” Marlyse K.
“Well thought out and very professionally presented programme. Great tools and ongoing practices. Really helped me re-look at my sense of meaning and purpose and re-connect with strands, passions and people in my life. Thank you for putting it together.” Dirk R.
“The course is outstanding in it's format and the way it allows people to move through the steps of aligning with their purpose in a way that is simple, yet inspirational and highly rewarding. I found Brandon's ability to relate exceptional and very motivational - I have never been so inspired or committed to complete any previous course or the like. I feel sure it has and will continue to positively change my life as well as other people in my circle. Having purpose is life.” Neville S.
“This course was an incredible inner journey, a marathon that pushed me past my old fears, catalyzed a shift in my thinking and empowered me to embrace my gifts. Brandon Peele is a genuine teacher who is a gifted storyteller and whose vulnerability empowered me to find my gold. Thanks to the course, I am now part of a purpose revolution. Join us!” Leo N.
"The experience of participating the Global Purpose Exhibition was both rewarding and challenging. Brandon's leadership and the quality of the material and exercises were excellent, incorporating both modern and ancient practices. For me and from the feedback of several other participants the exercise "Soul House" proved especially rewarding. What I have experienced since my completion of the course is that my purpose has become a center point in my life, a place that has grounded me in a deep and fulfilling way. It is the place that guides many of my decisions about how I live day-to-day, and serves as a reference for how I plan my future. If you are drawn to explore your purpose, I recommend to you Brandon and this program, and encourage your thoughtful consideration." David L.
"My life has changed since I’ve taken this course. I feel lighter. I don’t feel weighed down by a bunch of bricks that are holding me back from achieving my purpose. I have clear vision and goals now and tools to guide me through my journey . That in itself is not only amazing but magnificent. "One of the most important things I got out of this course was that we all are alike but yet different. We all exist together like on a “ship of souls” sailing into the unknown searching for our soul's purpose and how we can benefit humanity. "My favorite exercises are Entelechy and Soul House. Each time I did these exercises, it was different. For me it was like opening a space that allowed me to see things a different way that were happening in my life. The exercises take you through the garbage and clutter in your being by going into your soul and searching for answers or a clearing that allows you to look at what is going on with you in a safe space. If I feel lost or out of control I can do these exercises to find out what is at the core of these feelings. These exercises are what I call life long learning tools that you can do for the rest of your life to continue searching and opening up more visions, to create a purposeful life for all humanity. "What is next for me is to start a group for women that have been searching for their own enlightenment and purpose. It is a journey that some women don’t even know exists. I am expecting to start this group this Spring. I feel I am qualified to lead a group like this and help others on their journey of purpose. 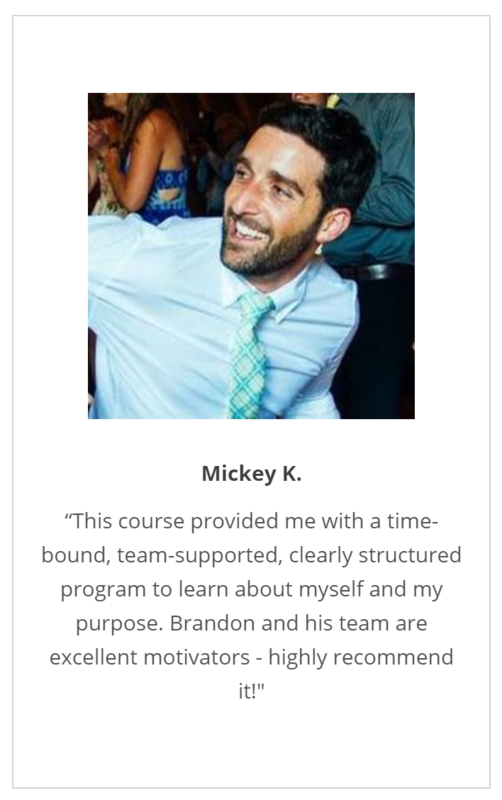 "The coaching I received in this course from Brandon was top of the line. Brandon is a intuitive listener and a compassionate human being who only has our best interests at heart. Brandon is a person who is safe to share your feelings and thoughts with . No judgement. He was there to guide us on our journey, making stops along the way that we’re important and letting go of ideas or thoughts that would compress our growth as human beings. He managed to open up the floodgates to reveal our purpose and freedom of our souls. Brandon is driven by his goal so that all mankind can achieve their purpose for the sake of humanity." Kerry P.
"Since taking this course, I have more presence, less fear. I was able to dialog with someone who had been inconsiderate to me, and approached that person with empathy and an understanding that we both have grown and developed in significant ways since those times many years ago. "My favorite exercise was Purposeful Titans – where I got to interview people in my life whom I judge are living their purpose. I found that the people being interviewed were happy to discuss their path, and that often they hadn’t foreseen the success and accomplishment that would come their way. This gave me the insight that living with intention can bring success and people are approachable about talking about their careers/passions. "Brandon is fun, authentic, living from a place of integrity. Has opened my mind to new topics, books, reading, and tolerance. If not for seeing pictures of Brandon at last year’s Women’s March, I would not be inclined to attend the March in Philly this weekend! And I’m the one bringing my wife to the march rather than vice versa. Great role model, I want to learn karaoke and risk getting closer to people I know (and people I don’t know). Brandon gives extra; facilitates with compassion. He's open to feedback and shares the credit for new ideas and the input of the experts / students who are working with him." Gary F.
"The Global Purpose Expedition was an energizing course that expanded and deepened my connection and contribution to my family, friends, career, and finances. Throughout the program, I was able to unravel the narrative of my story and identify my resistance to commit to projects and ideas that I enjoyed but somehow found myself stuck in fears, doubts, and insecurities. "Through the use of the Entelchy exercise and daily review of my Purpose Tree mandala, I continue to experience rebirth as I recommit and re-presence purpose though my powers, virtues, and vision. My biggest takeaways from the exercises has been to embrace the power of transformation by letting go of ego (sounds easy, right. Wait until your image consultant, wounded child, pessimist or other aspects of self kick in). "Since completing this work, my confidence continues to grow with the arsenal of tools I have gained to carry out my plans and tackle new challenges. If your intention is to take the course that enables you to connect to a higher version of yourself while defining purpose then, this is it! Brandon intentionally and strategically structured the course in a way that each can experience personal growth, community, and deeper connection to humanity and your higher purpose." - Kim G.
If after completing the entire course (completing all of the exercises, Purposeful Conversations, weekly surveys and accountability calls and attending the live calls), you feel the GPE was not effective, we will work with you to ensure that you are satisfied or give you a full refund. My name is Brandon Peele. I'm a Certified Purpose GuideTM, co-author of Purpose Rising (2017, with Dustin DiPerna, Ken Wilber, Terry Patten, Bill Plotkin, Tim Kelley, Duane Elgin, Barbara Marx Hubbard and many others) and author of Planet on Purpose (2018). As a veteran teacher of online purpose courses, I have guided thousands of people from over 50 countries to awaken, ignite and embody their life’s purpose. I have worked with professionals and executive teams from Apple, Johnson & Johnson, Illumina, Zeiss, Sapient, Morgan Stanley, Google and the United States Coast Guard, as well as with purpose-driven ventures such as Net Driven, Annmarie Skincare, Sacred Science and Dr. Hops Kombucha, to help them awaken their purpose-driven leadership. I have had the pleasure of guiding Catholic Priests, Dalai Lama Fellows, and world-class athletes, scientists, musicians and artists. My work has been covered by numerous media outlets such as USA Today, Techcrunch, Conscious Company Magazine, The Telegraph, International Business Times and Fox News, and I have taught and lectured at the University of California, Berkeley, Northern Arizona University, The Institute of Noetic Sciences and the California College of the Arts. Prior to finding my purpose, I built teams and led projects for a number of successful social enterprises (Lifefactory, SunTechnics, Babycenter / Johnson & Johnson), start-ups (Bebo/Aol., Crackle/Sony, Intertainer) and Fortune 500 Companies, such as Merrill Lynch & Co. and Autodesk. I've been trained in purpose guiding (The Purpose Guides Institute) and leadership (MBA in Leadership at Columbia Business School, Landmark Worldwide, Leadershape Institute), as well as communications, facilitation, mindfulness, culture and diversity (ITIM Hofstede Multicultural Training, Non-Violent Communications, The ManKind Project, Vipassana). If so, I invite you to register for the Global Purpose Expedition, and begin your journey now. I look forward to guiding you in awakening your purpose and empowering you to step into your big life of passion, creativity, connection, impact, fulfillment and joy.